ThrustMaster T300 RS - GT Edition - wheel and pedals set - wired - for PC, PS3, Sony PlayStation 4Thrustmaster accompanies virtual racers through their learning curve in terms of experience with the T300 RS, as this simulator lets gamers really take the plunge into the world of racing, and hone their driving skills for better performance. To achieve this, under the hood there's nothing less than a genuine brushless industrial Force Feedback motor (with frictionless action), combined with a 1080° dual-belt system to deliver super-smooth and quiet Force Feedback with incredibly responsive, realistic Force effects. Thrustmaster's development teams have added precision to the motor's impressive capabilities by incorporating H.E.A.R.T HallEffect AccuRate Technology, featuring a contactless magnetic sensor: this provides 16-bit resolution, for 65,536 values on the wheel's steering. The T300 RS also features an internal memory, upgradable firmware so that users will always have access to the latest improvements via the wheel's PC compatibility, and a PS4/PS3 sliding switch on its base for optimal compatibility with both systems. 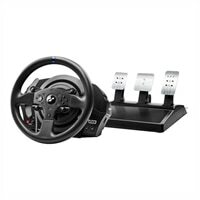 Thrustmaster accompanies virtual racers through their learning curve in terms of experience with the T300 RS, as this simulator lets gamers really take the plunge into the world of racing, and hone their driving skills for better performance. To achieve this, under the hood there's nothing less than a genuine brushless industrial Force Feedback motor (with frictionless action), combined with a 1080° dual-belt system to deliver super-smooth and quiet Force Feedback with incredibly responsive, realistic Force effects. Thrustmaster's development teams have added precision to the motor's impressive capabilities by incorporating H.E.A.R.T HallEffect AccuRate Technology, featuring a contactless magnetic sensor: this provides 16-bit resolution, for 65,536 values on the wheel's steering. The T300 RS also features an internal memory, upgradable firmware so that users will always have access to the latest improvements via the wheel's PC compatibility, and a PS4/PS3 sliding switch on its base for optimal compatibility with both systems.